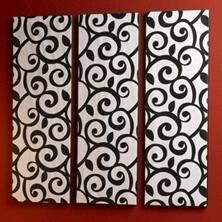 Create the look of expensive wallpaper using STYROFOAM™ Brand Foam sheets and a roll of your favorite wallpaper. With this quick and easy project you can add a little pizazz to any room in no time! Cut three 12" x 36" panels from wallpaper, taking note of desired design placement. Spread thick coat of white glue on back of first piece and press to foam sheet; smooth with fingers and let dry. Meanwhile, glue remaining wallpaper panels to foam sheets. Let dry completely. Beginning and ending at one lower corner, use glue gun to secure ribbon around edges of each foam sheet; trim excess, allowing a bit of overlap. Use poster adhesive to attach to wall. Or, glue saw tooth hangers to back of each panel; for additional hold, insert and glue two straight pins through holes in saw tooth picture hanger; let dry.